Frankfurt is a crucial financial and industrial metropolis in Germany. Every day it welcomes hundreds of business travelers. And even though these people mostly don't like lingering in the city they have some work to do, the two-thousand-year-old history of Frankfurt, as well as its fantastic beauty, can't leave even the strictest businessman indifferent. 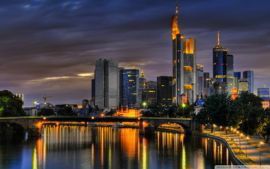 So, whether you have saved some money to travel to Frankfurt on this vacation, or you are here on business, unforgettable pastime and fabulous impressions are guaranteed! 8Rental European car supplier offers to rent a car with driver in Frankfurt on the most profitable conditions you could ever find in the market. We offer you amazing car models to suit any expectations you may have, free fuel, 24/7 customer support. What concerns the team of expert drivers, they are at your full disposal! Here are the major points we think you would like to learn more about. It will take you only a couple of minutes to place an order and have it proceed. For this, get a quote and devote some of your precious time to completing the mentioned points. You will be required to state the journey details. First, choose the type of your supposed trip and the start date and time. This will be needed to calculate the final cost of your order. Afterward, choose the pickup and destination addresses. The number of passengers is required to find out whether you need a car, a van or a bus. If you plan to hire a chauffeured car in Frankfurt, you can mention that you'll be traveling alone. The next step will be choosing the car model and the language your driver should master. By the way, we have drivers who speak not only German, but other languages, too including English, Russian, French, Italian, and so forth. In case you have any additional requirements, you are free to mention them here. For instance, if you would like to be met right at the airport or the railway station, we can organize it. Need an affordable yet elegant car? Or perhaps you prefer to drive in luxury? In both cases, 8Rental reputable car rental service definitely has a perfect car for you. By hiring a standard class car, you will get the primary comfort amenities such as convenient seats, air conditioning, climate control, audio system, etc. Book a Skoda Octavia, a Toyota Camry or any other standard class car profitably right now! Booking a business or a first-class car such as a BMW 7 or an Audio A6, be prepared to face all the luxury specs you can ever think of! All the models included in these classes come equipped with fine leather upholstery, heated and cooled leather seats, cruise control, dual-zone climate control, and so forth. If you want a TV, a minibar or any other extra amenity to be installed in the vehicle, just let us know when you rent a chauffeured car in Frankfurt from 8Rental. 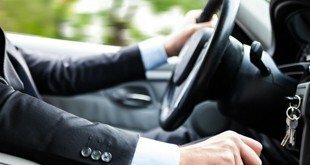 When you hire a car with driver in Frankfurt, you can be entirely calm for your safety as we deal only with licensed and experienced drivers. All of them are real experts and will take you to the right direction in a quick and safe manner. They are well aware of the city roads, are responsible and eager to please you. 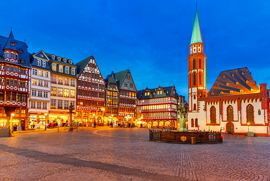 Frankfurt can allure any traveler with its magnificent architecture, sights of cultural and historical significance, dynamic entertainment establishments and nightlife, a well as charming parks and natural sights. There more than fifty museums, a great variety of bars and clubs, a pedestrian shopping street and much more to enjoy here. One simply can't get enough of Frankfurt even after the second, third or even fourth visit. Agree, that two thousands years of history are totally enough for having a "bouquet" of most diverse sights! However, if you are already here, just rent a chauffeur-driven car in Frankfurt and try to explore as much as you manage. If you have only one day left to admire Frankfurt, make sure you visit at least Palmengarten, Romer, Cathedral of St. Bartholomew, Staedel Museum, St. Paul's Church, Marchenbrunnen.